The very first thing you see when you enter the gym is an array of shiny machines. For a few days, you use them vigorously and regularly. However, as time passes by, doing cardio starts feeling like a chore. Whether you like it or not, it still is beneficial to your health as it not only helps you lose weight but also has the added benefit of healthier heart and lungs, improved muscle density, and reduces stress. Therefore, if you are looking to skip the gym, you can easily buy one of the best cardio machines for home use and exercise from the comfort of your own home. The best cardio machines allow you to move large muscles of your body, which need a lot of Oxygen. The most typical machines used at gyms include Treadmills, Stationary Bikes, Elliptical Trainers, Step Mills, Climbers, Rowing Machines et cetera. Customizing your cardiovascular exercise to meet your certain goals can be more beneficial than doing a full routine exercise. We have compiled a list of the best cardio machines to use at home for all your cardio needs. The Exerpeutic Magnetic Upright Bike is an all-in-one type of machine. It comes with a magnetic tension control system to modify the tension of the machine. This modifies your workout to make it easier or harder. It is designed to be used on a flat, hard surface and can sustain up to 300lbs of weight. It contains a hand pulse monitor, which monitors your heart rate as you exercise. It is one of the best cardio machines for home use because of its compact design. It can easily fold to half of its original size and then it can be rolled away to wherever you deem fit. The seating is very large, making it comfortable for individuals of any size. It can easily fit users from 5’3” to 6’1” due to adjustable screws. Furthermore, it has a wide screen that displays the distance you have covered, calories burned, and heart rate. It is suitable for all age groups because of its ease and comfort. It can support a weight of up to 300 lbs. The seating is very large and can accommodate users with heights ranging from 5’3” to 6’1”. It can be folded up to half its original size and can be transported with the included wheels. The tension can be adjusted to make your workouts easier or harder. It has a wide computer screen (3.3”X 1.5”) to display burnt calories, heart rate et cetera. It is very easy to get on and off the bike because of its unique design, resulting in a more effective workout. Overweight folks can easily use it. It has leg stabilizers built into them, which prevents tipping while exercising. Provides a smooth and quiet operation. It is portable and comes with transportation wheels to move it to the desired storage place. It might get uncomfortable due to the large size of the seat if you a smaller frame. The mileage on the console is limited to only three digits and resets after reaching 999.9. 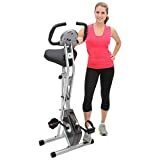 The Exerpeutic Folding Magnetic Upright bike is for those who prefer flexibility in their exercising routines, as it allows them to adjust the tension and maintain their desired heart rates. It is convenient to use at home, as it is portable and foldable. It provides the best workout for people of all sizes and weights. 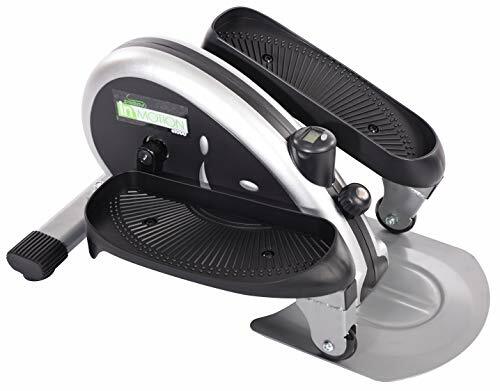 Stamina In-Motion Elliptical Trainer is a compact cardio machine that can easily fit under your office desk or anywhere in your house. That makes it ideal for use along with being compact; they provide all the similar health benefits as any other cardio machine. This machine entails a foot-pedal-only chassis, and that can also be used while working or sitting. The unique and comfortable design protects your hips, knees, ankles, and back. It includes a sturdy electronic monitor, which monitors exercise time, calories burn, and strides. 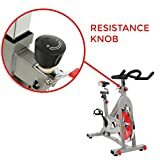 Moreover, it has an adjustable tension knob that can adjust the intensity of your workout quite easily. It burns the same amount of calories as jogging without inflicting any stress on the joints. The pedal-only design makes a great workout while sitting. Thus, it can support a large range of weights. It is the most affordable product on this list. It is a compact, portable, and easy to use in the office. Embraces a built-in monitor, which records, time, burnt calories and strides. 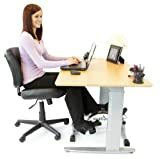 It only has foot pedals and can be placed under the desk or on the floor to exercise while sitting. The pedals have a textured surface so your feet will not slip and you can pedal as fast as you like. It comes in three colors, i.e., Black, lime green and bright orange. When used in the standing position, you have to balance yourself, which means you will be engaging the core. When used in the sitting position, it will target your lower body and burn calories solely from this region. Works in both the reverse and forward direction. Changing the direction will target different muscles in your body. It is compact and can be easily stored. It could discourage the use of other regular gym equipment, as it can be too convenient to exercise while sitting. It weighs around 25 lbs. and does not have a handle, so might be hard to move around. The compactness of the Stamina In-Motion Elliptical Trainer makes it one of the best cardio machines for home and office use. It makes it easier to burn calories while watching TV, using a computer, or even while eating food. Its comfortable pedals are another advantage, as they do not put stress on the body while ensuring you get a good workout. 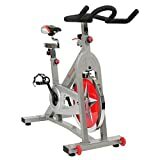 When talking about the best cardio machines for home use, it is impossible not to mention the Sunny Health and Fitness Pro Indoor Cycling Bike. It comes integrated with a 40 lbs. flywheel and can support up to a weight of 27 lbs. It provides you the full cycling experience at home. It is the best cardiovascular exercise to keep your legs fit and healthy. This bike is fully customizable for the ultimate comfort experience of the user. The seat, resistance system, and handlebars are adjustable. You can easily adjust the tension for the required intensity of your workout. The heavy-duty steel frame makes the bike durable and sturdy. It weighs 9 lbs., but not to worry! It comes with transportation wheels, which make it easier to shift it from one place to another or to store it. The bike has a weight capacity of up to 275 lbs. It has an adjustable resistance system, which can be adjusted according to the needs of the user. The adjustable seat and handlebars provide added comfort and support all types of body frames. The 40 lb. flywheel ensures stability and momentum to keep your workout going without any unwanted stops. Cycling on this bike is smooth with no jerks, out of control movements, et cetera. As compared to other bikes, it is lower in cost making it more attractive. The assembly of the bike is straightforward and can be done even if you know next to nothing about that. It entails transportation wheels, for easy shifting. The sturdy metal frame makes it strong and durable. It provides a smooth ride, without any bumps. The bike has no electronic meter to measure how much distance you have cycled. The cycling might be noisy, and the bike itself is not compact enough to fit anywhere in the house. The Sunny Health and Fitness Bike are for those who want to cycle in the comfort of their home. It burns all the extra calories, and this bike is adjustable. While it is much lower in price than other bikes, it still carries all the essential features you need for a healthy workout. 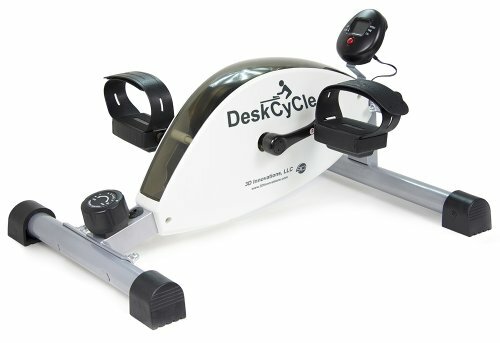 The DeskCycle Exercise bike is one of the lowest bikes available. The pedals are only 10 inches high and can be used with desks with a minimum height of 27 inches. It makes it easier to lose some calories and boost your fitness while working on a desk in the office, home, or even school. This exercise bike embraces a patented magnetic resistance system, allowing users to customize the resistance according to their needs. It comes with eight different types of resistance settings. Furthermore, it provides a smooth experience, which is healthy for the knees, joints and does not distract you from your work. In addition, it has a display monitor, which shows speed, time, distance, calories, etcetera. You can use it while watching TV, reading books, playing games on your phone, working at your desk or even while sitting. This machine heavily targets your lower body, making it fit and healthy, so you end up feeling more productive even if all you did was sit and cycle. It comes integrated with a patented magnetic resistance system, with 8 different settings to choose one. Comprises of an online calorie calculator that improves your calorie estimation. It has a 5-function display screen; speed, time, distance, calories, and scan. Entails the lowest pedal height, about 10 inches. It comes with a 39 lb. flywheel. The heavier the flywheel, the smoother the workout is. The pedals have adjustable Velcro straps that can fit any shoe size. It has a 20-inch wide front leg, which eliminates rocking. It is bidirectional, i.e., can be pedaled both forwards and backward. This targets different groups of muscles. It uses a touch-less magnetic resistance. Thus, it is quiet and it won't cause distractions. It can fit beneath the smallest of desks, a minimum of 27 inches. The front wide leg and the 39 pounds flywheel ensures smooth pedal motion. It increases your energy expenditure by 50% more than just sitting at your desk. It could be a problem for someone taller than 5’7”. You might need a larger desk and extend your legs a bit more. Can cause wear and tear on your chair because bicycle bikes are sturdier while your sofa or office chair is not. It does not come as a surprise this machine ended up on our best cardio machines for home use list. It is small, compact, and can easily fit under the chair while providing you all the benefits of a workout. It is highly adjustable and can be customized according to your specific workout plan. If you want to monitor your workouts closely, then the 5-function display screen is just what you need. 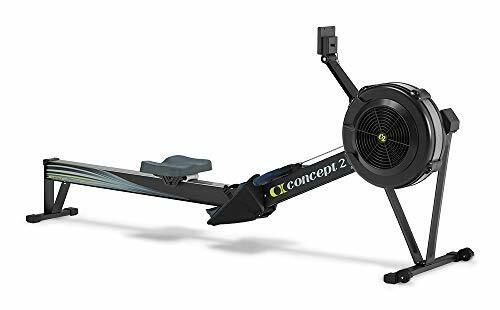 The practical design of the Concept2 Indoor Rowing Machine is one of the best when it comes to torching calories. It has a 14-inch seat height and a weight capacity of 500 lbs., making it sturdy and durable even under large weights. When fully assembled, it requires a space of 9ft by 4 ft.; however, it separates into two pieces and can be easily stored. In addition, it comes with wheels for easy moving. Rowing is a full-body workout, unlike the others on the list that mostly focused on the lower body. It also embraces a Performance Monitor 5, which gives accurate data and saves it for future comparisons. It has adjustable footrests and monitors arm, which can fit all sizes. Furthermore, they are smooth functioning and quiet, which makes it one of the best cardio machines for increasing productivity comfortably in your home. The weight capacity of this machine is 500 lbs. It requires a space of 9ft by 4 ft. while the seat height is 14 inch. The Performance Monitor 5 records all data accurately and compares it. It also entails a backlight for visibility and can be attached to a USB so you can store and backup all rowing data. The damper and flywheel work in such a way that you are in full control of all strokes. The flywheel dampens the noise while making the workout smoother. The machine can be separated into two parts, and caster wheels can be attached for mobility. The footrests and armrests are adjustable to your needs. Comes with a 5-year warranty on the frame and a 2-year warranty for the Performance Monitor. The User Manual, Performance Monitor, Quick Start Guide, tools, and assembly instructions are included when you buy the machine. The Performance Monitor can save data with every row, so it's easy to compete with yourself. The Performance Monitor can be connected to a USB for backing up data. It takes up a lot of space so you should only buy it if you have some space you can spare. It could damage hardwood or polished floors, so a mat is recommended. The Concept2 Indoor Rowing Machine is a modern machine with an exceptional data monitoring system in the Performance Monitor. The best cardio machines for home use should usually incorporate full-body workout, which this machine does flawlessly. It can support large weights (up to 500 lbs.) and can be used by anyone. Although it's pricey, it still is worth it because of the latest technology it incorporates. Well! After all the discussion on the best cardio machines for home use, let's now announce the winner. Although all machines have their own pros, cons, and all of these do help you lose weight, but the clear winner in this list has to be one with the best adjustability, best monitoring system, full workout system, and diversity of users. It should come as no surprise that the Exerpeutic Folding Upright Bike takes the trophy. It successfully triumphed over the Elliptical Trainer because it provides full-body workout instead of just the lower body. We preferred the Upright Bike against the Cycling Bike because the former can bear up to 300 lbs., while the former bears only 275 lbs. 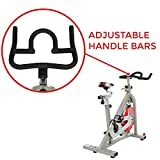 In addition, The Upright Bike features a heart rate monitor, but the Cycling Bike does not. It won over the Exercise Bike this machine provides a full body workout and support a person with a taller height than 5’7”. It was a tough competition between the Rowing Machine and the Upright Bike, but one look at the price tag made up our minds. 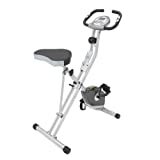 Overall, The Exerpeutic Upright Bike is affordable, provides a full body workout and lets you adjust your own routine.